I used Orly Pixy Stix as a base, with Sally Hansen Black Orchid for the black lines, and Nubar Violet Sparkle for the glittery purple lines. Topped everything off with 2 coats of Seche Vite top coat. And I love Pucca. Could do about Pucca too! 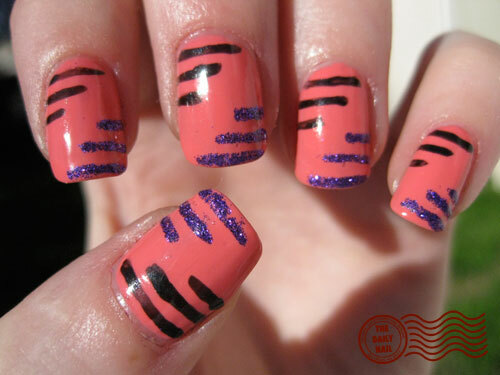 I like these nails very cute and simple, I almost did mine similar today but changed my mind. Cool bread art too! omg, I know this blog is about nails and stuff but that bread, wow. Honestly as i was skipping through your blog(to catch up, again) I was this picture, and I couldn't believe that it was made of bread dough!!! Wow!!!! 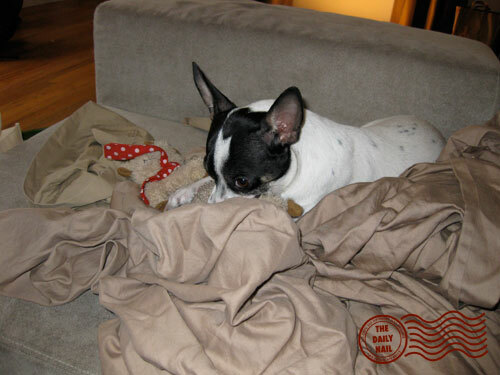 !I loved all your post...the nails, your cute dog and the bread, hummmmmm, looks delicious!!! That bread art is so lovely! I repeat my earlier comment- show your food portfolio around, get some investors, and open a bakery/confectionery! People would buy yummy things from you! I certainly would! It is so pretty, I'd almost hate to eat it. Almost. Awh, Homey! <3 Love the nails and bread as well! cool. I had Chef Ray but he had a heart attack halfway through the semester. 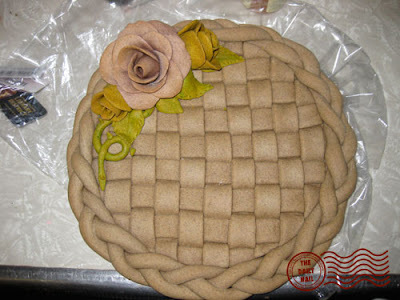 Cool bread art! Someone said on another blog that May 4th is Star Wars Day. Are we going to see some Star Wars based nail art? Who dosen't like glitter? lol you need to see Ellen Degenerous's opinion on glitter. hi! your nail paintings are awesome! I saw your post about the brazilian viewers and I had to comment on that, I just saw a small link to your blog on a brazilian journal for teens (today's journal! ), and and I'm sure you're going to be astonished with the increase of your brazilian viewers from today! Love the nails! Super cute and simple. This Blog is awesome, I was so taken away when I saw this,made a mental bookmark and anticipate coming to the site each day to check what you have done. Heard you needed a job, You should become a nail technician, People will pay top dollar to have you do their nails. Nice! You should do a nail design about nail polish hahaha! redundant, i know but wouldn't that be great? Justjan- I've actually started considering that actually! I contacted the local beauty school, and one of my friends gave me an idea for an interesting niche that might be yet untapped. Anonymous- yes, I do as often as I can. Sometimes I can't do it every day, since life takes precedence over internet more often than not. Right now I'm looking for a job, so that life event has changed how often I can respond. It doesn't reflect how I feel about everyone's thoughts and comments, they mean the world to me, and sometimes are the only thing that make me smile on bad days, and I do my best to show that, but sometimes I can't please everyone and do everything.